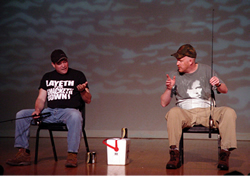 Joe Bill and Mark Sutton have performed improvisational works for the past 15 years and have developed their show, "BASSPROV," from their specific views on improvisation: making strong character choices, overcoming personal fears by charging them headfirst, and developing trust by providing your partner with a strong worldview. This philosophy carries over into the off-stage world, as strong choices in life and business reap better rewards than weaker ones. Over the past five years, they have taught their style of improv to countless students, ranging from teenage actors to corporate managers. They have been asked to teach their perspective at improv festivals and private classes throughout the past year, and are available to teach in Salt Lake City from March 24-25, 2006. This class is open ONLY to University of Utah students. It will be taught by Joseph Kyle Rogan and Jesse Parent of JoKyR and Jesster. Nine students from this class will be selected as the cast of Friday's Scramble workshop and recital with Joe Bill. If you want to participate in the Scramble as a U of U student (i.e. for FREE), you must attend this workshop first! Please note that priority in casting will first be given to officers and members of The Slapstick Association (U of U club, it's FREE to join). The Scramble is a form that explores long form improvisation through the order in chaos. It employs a set of theatrical devices that are favored by Chicago Improv Heavy Weight Joe Bill, including but not limited to, living tableau opening with underscore, overlap scenes and edits, solo starts and bolts, swinging gates and chair pimps, and multi-dimensional madness...oh yes, and some very grounded scenework thrown in for good measure. This workshop is designed to be a 1 day training and rehearsal to facilitate a Utah Scramble cast performance on Friday night. This class is only open to students selected in Wednesday's JoKyR and Jesster workshop. Get out of the rut. This workshop will help you find fun in the most mundane situations. It will show you ways to discover freedom in scenes that seem to go nowhere. You will look at all the relationships in the scene NOT just the one with your scene partner. You will learn ways to take chances and make connections that will enhance your characters, your scenes and your long-form. The Bat is a long form improvisation created by Joe Bill with 1990's super group, Georgia Pacific. It is The Scramble in the Dark. It is that from which the Scramble is born. It is performed in the dark. This workshop will work backwards to touch on Scramble techniques, and then quickly find students broken into groups and performing The Bat. All secrets will be revealed, all minds will be blown, and a new light will be shone on the value of verbal specificity. Have you ever created something great at the top of a scene and then lost it? Have you started with a wonderful character and then struggled to keep it wonderful during the scene? Have you found yourself "lost" as the scene progressed? Well...NO MORE!! This workshop will help you FOCUS. You'll learn how to better connect with your character, identify and heighten what you're about and see the scene through your own unique point of view. Stay stronger...longer, and make better scenes. The Scramble is a form that explores long form improvisation through the order in chaos. It employs a set of theatrical devices that are favored by Chicago Improv Heavy Weight Joe Bill, including but not limited to, living tableau opening with underscore, overlap scenes and edits, solo starts and bolts, swinging gates and chair pimps, and multi-dimensional madness...oh yes, and some very grounded scenework thrown in for good measure. This workshop is designed to be a 1 day training and rehearsal to facilitate a Utah Scramble casts performance on Saturday night. Joe Bill is one of the co-founders of Annoyance Theater, where he taught improv and performed in and/or directed over 50 productions, including the smash hits Co-ed Prison Sluts, The Screw Puppies, The Real Live Brady Bunch, Manson: The Musical, That Darned Antichrist and Donkey Improv. He has coached and performed with numerous ensembles at Improv Olympic, among them Inside Vladimir, The Lottery, Little Room, and Georgia Pacific, with whom he developed the innovative, lights out longform "The Bat." He has taught and directed his other signature form, "The Scramble," in Chicago, New York, Miami, Seattle and Phoenix, where it has been performed by improvisers from all over the United States, and from all different groups. Joe performs with Improv Supergroup, Weasiliscious, The Armondo Diaz Theatrical Experience, and Hootenanny, and teaches and coaches at The Second City Conservatory, The Playground, and Improv Olympic. He has taught Improvisation all over the U.S., Canada, the U.K. and the Netherlands. Mark Sutton is one of the most respected and sought after teachers in improvisation today. He is a founding member of Chicago's legendary ANNOYANCE THEATER and, for 10 years, was the Theater's managing director. Mark is on the faculty of both ANNOYANCE and The Second City, and has been a featured instructor at comedy festivals across the United States and Canada for many years. He helped develop the aggressive, personal power style of improvisation pioneered by Mick Napier at The ANNOYANCE. Mark's no nonsense, personal style of teaching has inspired and enlightened thousands of students during his 20 year career. The cost will be $30 per person per class, $50 for two classes, due day of the class. Questions? Contact Joseph Kyle Rogan at maestro@kysoff.com or call 801-891-6397.